Yiying Wu received his B.S. in chemical physics from the University of Science and Technology of China in 1998, and his Ph.D. in chemistry from the University of California at Berkeley with Professor Peidong Yang in 2003. He then did his postdoctoral research with Professor Galen D. Stucky at the University of California, Santa Barbara, and joined the chemistry faculty at The Ohio State University in the summer of 2005. He won the Cottrell Scholar Award in 2008 and NSF-CAREER award in 2010. He was promoted to associate professor in 2011 and professor in 2014. Our group focuses on materials chemistry for energy conversion and storage. We are currently investigating projects on dye-sensitized solar cells (DSC), electrocatalysis and Li-ion batteries. Our research encompasses materials synthesis, electrochemistry and photoelectrochemistry. We are interested in oxide semiconductors, graphene, dye molecules and hybrid materials. Finding energy sources to satisfy the world’s growing demand is one of the foremost challenges for the next century. Utilizing solar energy will be a major component in efforts to address the energy challenge. Compared to the conventional silicon p-n junction cells in market, dye-sensitized solar cells (DSSCs) hold the promise of lower fabrication cost and have efficiencies comparable to amorphous silicon solar cells. Despite their significant developments, there is an urgent demand for further improving the efficiency and stability for their practical applications. Our research activities include (1) discovering new materials for electrodes, sensitizers (dye molecules and quantum dots) and electrolytes, (2) assembling complex nanoscale electrode architectures with large surface area and long electron diffusion length, (3) understanding the charge transport and recombination mechanisms, and (4) creating tandem DSCs with super high efficiencies. We are interested in gaining fundamental understanding of the processes occurring in new generation nanostructured lithium-ion batteries combining high energy density, lightweight, flexibility, and high mechanical stability with excellent electrochemical performance in a wide range of working temperatures. The goal is to capture benefits of nanoscience in new battery technology. For example, we have recently developed a facile low-temperature solution-based method for growing large-area Co3O4 NW arrays on copper foil and other conducting substrates. Freestanding nanowire arrays with open spaces between individual nanowires allow easy diffusion of ions between them, and therefore high charging and discharging rate. Their direct growth on copper foils also facilitates their electric contact with the current collector. Moreover, the nanowires are mesoporous, and therefore the contact area between the electrolyte solution and the electrode would be further enhanced. These features make the as-made NW array a very promising candidate as the negative electrode material for Li-ion batteries. We are also working on cathode materials. Oxygen evolution reaction (OER) is coupled with a number of important cathodic processes, for instance water splitting for hydrogen production. An effective electrocatalyst can reduce the overpotential and thus enhance the energy efficiency. Therefore extensive research efforts have been invested in developing inexpensive and efficient OER electrocatalysts that have sufficient stability in prolonged exposure to oxidizing conditions. Co3O4 has been demonstrated to have good efficiency and corrosion stability for the OER. It also has much lower cost than RuO2 or IrO2-based catalysts. We are interested in the OER studies of Co3O4 nanowire (NW) arrays. Nanowire arrays grown directly on conductive substrates have several structural advantages: the open space between NWs can facilitate the diffusion of active species; the large surface areas associated with NWs and their mesoporous structures accelerate the surface reaction; and the direct contact of NWs to the underneath conductive substrate ensures each NW to participate in the reaction and also allows their direct use in the electrochemical cells. We are also interested in the doping of Co3O4, as well as other new materials. Our financial support comes primarily from the National Science Foundation and the Department of Energy. Recent members of the Wu group now hold faculty position, postdoctoral position as well as industrial research position. 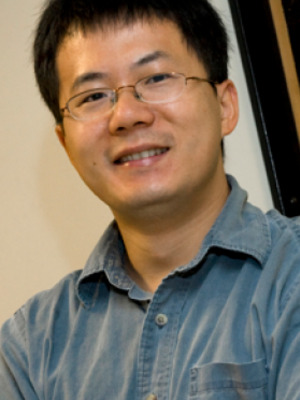 Yiying Wu will be taking on new graduate students and welcomes inquiries regarding openings in his group. G. Natu, Y. Wu. “Photoelectrochemical Study of the Ilmenite Polymorph of CdSnO3 and its Photoanodic Application in Dye-Sensitized Solar Cells” J. Physical Chemistry C, 114 (14), 6802 (2010). Y. Li, P. Hasin, Y. Wu. “NixCo3-xO4 Nanowire Arrays for Electrocatalytic Oxygen Evolution”, Advanced Materials, 22 (17), 1926 (2010). Y. Li, Y. Wu. “Coassembly of Graphene Oxide and Nanowires for Large-Area Nanowire Alignment”, J. Am. Chem. Soc. 131(16) 5851-5857 (2009). M. A. Alpuche-Aviles, Y. Wu. “Photoelectrochemical Study of the Band structure of Zn2SnO4 Prepared by the Hydrothermal method”, J. Am. Chem. Soc. 131(9) 3216-3224 (2009). P. Hasin, M. A. Alpuche-Aviles, Y. Li, Y. Wu. “Mesoporous Nb-doped TiO2 as Pt Support for Counter Electrode in Dye-Sensitized Solar Cells”, J. Phys. Chem. C. 113(17) 7456-7460 (2009). Y. Li, B. Tan, Y. Wu. "Ammonia-Evaporation-Induced Synthetic Method for Metal (Cu, Zn, Cd, Ni) Hydroxide/Oxide Nanostructures", Chem. Mater. 20: 567-576 (2008). Y. Li, B. Tan, Y. Wu. "Mesoporous Co3O4 Nanowire Arrays for Lithium Ion Batteries with High Capacity and Rate Capacity", Nano Letters, 8: 265-270 (2008). B. Tan, E. Toman, Y. Li, Y. Wu, "Zinc Stannate (Zn2SnO4) Dye-Sensitized Solar Cells", J. Am. Chem. Soc. 129(14), 4162 (2007). Y. Li, B. Tan, Y. Wu, "Freestanding mesoporous quasi-single-crystalline Co3O4 nanowire arrays", J. Am. Chem. Soc. 128, 14258-14259 (2006). (highlighted by Nature Nanotech. (Oct. 2006)). B. Tan, Y. Wu, “Dye-Sensitized Solar Cells Based on Anatase TiO2 Nanoparticle/Nanowire Composites”, J. Phys. Chem. B 110: 15932-15938 (2006).